Bernard Pollard, then a Chief, began his destruction of the New England Patriots in 2008 with this shot to Tom Brady's knee. In New England there are a few names that stir up such hatred that loyal sports fans refuse to utter them. That Roger Clemens guy is on the list. But in recent years there is one name that not only spurs loathing, it also strikes fear into the hearts of Patriots fans. It’s the one and only Bernard Karmell Pollard. He is public enemy #1. Many say he is a curse. Maybe that's a little extreme, but it is certainly hard to believe how much havoc one man has brought upon one team over the past 5 years. It all began back in September of 2008. On that fateful Sunday in early September, Patriots fans felt devastation unlike any other. After finally recovering from David Tyree’s “Helmet Catch” in the Super Bowl and a ruined undefeated season, New England watched their beloved quarterback go down with a knee injury that would end his season and their Championship hopes. 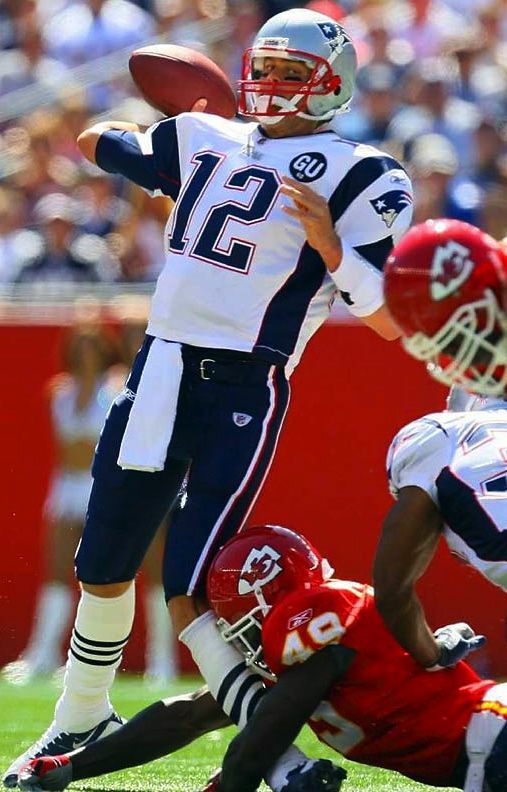 It all happened at the hands of then-Chiefs safety Bernard Pollard, who hit Brady low after coming on a blitz. The injury left the Patriots season in the hands of somewhat-capable QB Matt Cassell. It wasn’t the worst season but they missed the playoffs. Not a fun way to follow up one of the greatest seasons an NFL team has ever had. The injury even led to what is known as the “Brady Rule” which states that a defender already on the ground cannot lunge at or under a quarterback’s knees. The rule came too late to save New England’s boy wonder, and Patriots’ fans blamed one man: Pollard. Skip ahead to 2009. Pollard, now a member of the Houston Texans, was playing the final game of the regular season against New England. A little guy named Wes Welker played for New England at the time, and when Pollard got his hands on Welker he immediately ended the receiver’s season. The Pats lost their star wide out for the entire postseason to a torn ACL. Now we fast-forward a few years. It’s 2012 and Pollard is with the Baltimore Ravens (cue the collective cringe in New England). With 43 seconds to go in the third quarter of thr AFC Championship Game, the Pats had a first-and-10 on their own 37 yard line. Tight end Rob Gronkowski caught a pass from Brady and then all of the sudden Bernard Pollard happens. Ankles just should not bend that way. Gronk was only out for a few plays, as he actually returned for the drive that resulted in a 4th down quarterback sneak that sent New England to the Super Bowl, but the damage was done. He was severely limited in the big game, and the Patriots again fell to the Giants on Super Bowl Sunday. Gronk had always seemed indestructible. Have you been paying attention lately? He’s gone through more injuries and more surgeries than one can count. The Curse of Bernard Pollard. His tackle is like Kryptonite. But that’s still not the end. Cut to the 2013 AFC Championship Game and again it’s the Ravens and Patriots. Ravens lead the Pats 21-13 in the 4th, but the Patriots have the ball and are moving towards what could be a game-tying score. Stevan Ridley gets the ball. He puts his helmet down and charges forward for a few extra yards. Unfortunately, he runs smack into Bernard Pollard. Ridley was knocked out cold on impact, causing him to fumble the ball. The fumble sealed New England’s fate. They lost. No Super Bowl this time. The latest installment of the curse flew a little under the radar though. In case you have been living under a rock, the Patriots have been dealing with a little situation with their now former tight end Aaron Hernandez. He managed to get himself thrown into jail after being accused of murder. How does this relate, you ask? We have to rewind to that AFC Championship loss in January again. The Patriots last drive. Tom Brady lobbed a short pass to Aaron Hernandez for an 11 yard gain. Who tackled Hernandez on the play? You guessed it; Bernard Pollard. The last man to tackle the troubled tight end was none other than the man who has single-handedly decimated the Patriots offense for five years. Pollard was a free agent this year and the Patriots had their chance to pick him up and control their own fate. Who knows? Maybe they were terrified he would accidentally destroy the limbs of the entire offense in practice. Fortunately, the safety now plays for the Tennessee Titans and New England is not scheduled to face them until 2015. Barring any pre- or post-season meetings the Pats are safe for a couple seasons. So for now, the curse stops with Hernandez. It is too early to tell if he is just the newest chapter in this story or if this is where the book ends. Regardless, Bernard Pollard will forever remain a terrifying figure in Boston sports history.